The quirky juxtaposition of Sushi-Rama’s 70’s décor and modern conveyor belt sushi delivery makes patrons feel a little adventurous. What’s the risk, when pieces are delivered two-at-a-time and menus describe everything in English? 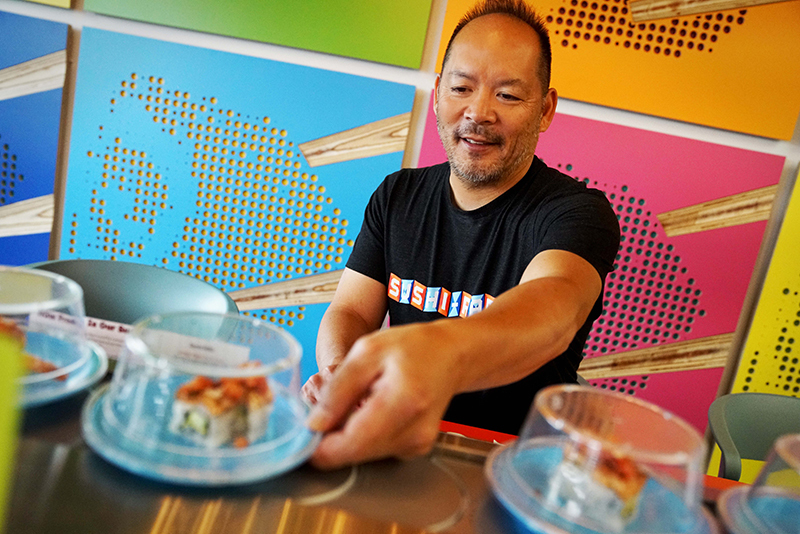 The restaurant’s concept creator, Chef Osaka, gave us the inside scoop on which rolls are hot right now, and how they keep their sushi fast, fresh and affordable. met a girl in California who was from Denver and wanted to move back. So, in 2008 we moved here together, and a year later we were married. We have a seven-year-old daughter now. In addition to Sushi-Rama, I have Twelve at Madison which is in Congress Park, and Osaka Ramen in RiNo. This is our third Sushi-Rama, the others are in RiNo and the DTC area. Our next one will be part of the DIA concourse A and part of the Denver Central Market downtown. We’ll also be opening soon in Aurora near the VA hospital. #2. 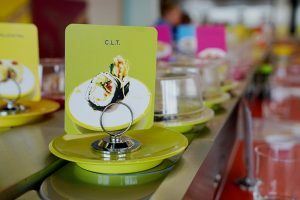 You’re unlike other local sushi restaurants because your patrons select their sushi off a conveyor belt that snakes through the restaurant, and while this might be a new offering in RidgeGate, this concept has been popular for a while, hasn’t it? Chef Osaka: It was actually first introduced at the World’s Fair in Tokyo in the ’50’s when a conveyor belt manufacturer demonstrated the idea. 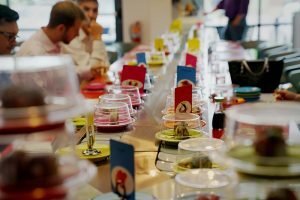 The traditional name for conveyor belt sushi is “kaiten sushi.” It’s the only concept I know of where you can immediately sit down and start eating. Even if you go to a buffet, your server comes and takes your drink order. 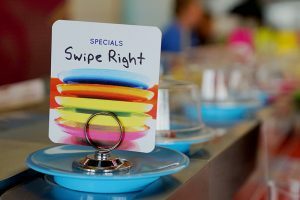 We do that here, but while you’re ordering you can start to take plates off the belt and eat immediately. Our plates are color-coded to reflect the pricing, and you can get descriptions of each roll on your menu. When you’re done, they’ll count your plates and total it up. The plates remain in front of you until you’re done. We usually clear lids away. On average, I’d say people go through about 8 to 10 plates per meal. Chef Osaka: If you look underneath our plate here, you’ll see a microchip sticker. This tells us how long a plate has been on the conveyor belt. There is actually an arm that kicks off plates that have been on past a certain time. We very rarely have that happen because we go through sushi so quickly. That’s a true advantage to this concept. Everything lends itself to being fast and fresh. #4. …And fun! Your interior looks like something out of the movie Austin Powers. Chef Osaka: Haha, yeah, we’re going for that whole summer of ’76 joy, peace and love vibe. It’s really colorful. out the rice balls for the nigiri, the fish on rice which you see here. 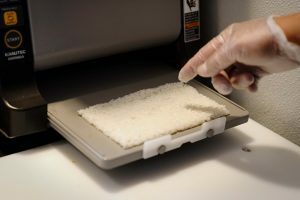 And then one prints out sheets of rice that we put the seaweed—nori—on for our rolls. So instead of doing it all by hand, we have a machine that does it which makes us more efficient. We can do a dozen sheets by the time one sushi chef can put rice on one. What’s most important is the quality and consistency is exactly the same…from the first roll to the last. #6. A couple and a little boy just sat down at a booth next to us. Is this a family-friendly restaurant? #7. So, efficiency in the kitchen is one of the ways you keep costs low, but you buy the same fish and rice as most of the higher end sushi bars in town. Doesn’t that impact your pricing? 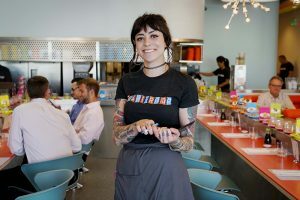 Chef Osaka: Actually, we have a commissary kitchen in Park Hill, and we purchase directly from brokers rather than third-party fish purveyors in town. We handle the fish from beginning to end, rather than have someone deliver it to us. We have people cutting fish into blocks at the kitchen, rather than having to worry about each restaurant having a skilled sushi chef on site. #8. 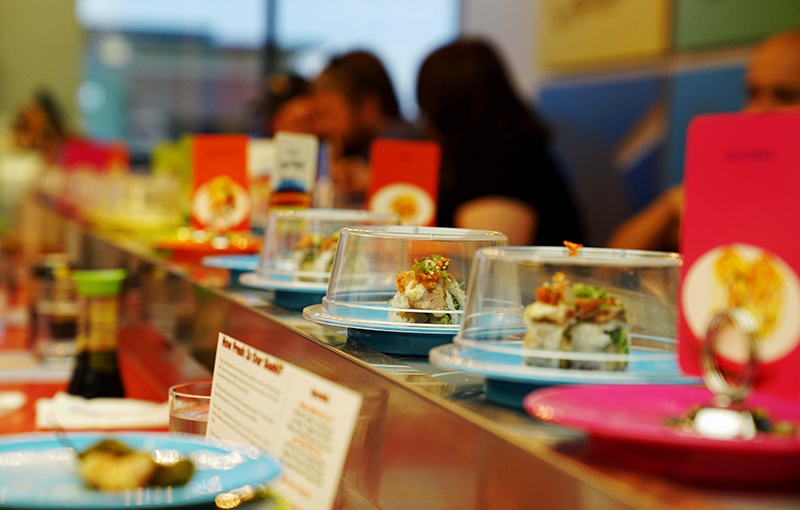 Do you have any special rolls for the more adventurous sushi eater? Chef Osaka: Exactly. We’re trying to build that younger clientele, so we’ve come up with some fun names. Swipe Right is one we’ve been trying out. It has seared salmon and shrimp in it. #11. The “Lone Tree Roll” is going by us now. What’s in that one? Chef Osaka: Soy honey tofu, asparagus, and bib lettuce topped with Korean steak, kimchi, Negi, sesame mayo and sesame seeds. #12. People of all ages love their happy hour specials. Does Sushi-Rama have one? Chef Osaka: Of course! From 3 pm to 6 pm we offer 25% off all plates on the belt, and the same with a few select drinks. This location doesn’t have a bar you can sit at, but we have a full-service liquor license. Our Green Tea Mule is really popular, we use Green Tea infused vodka and ginger beer. People should also know you can order sushi to pick-up and take with you as well.